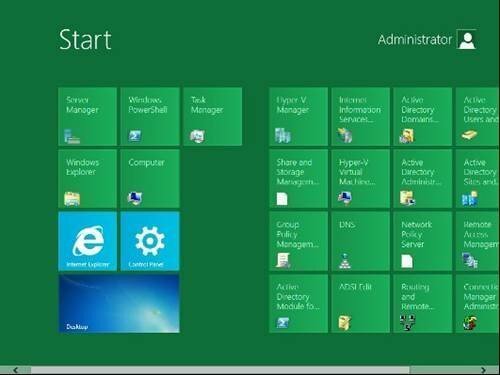 The Windows Server 8 developer preview has the new Windows 8 user interface, making the point that the two new operating systems share a common core. Whether or not the new start menu will appear on the final release of Server 8 is unclear, even presuming that you install the full GUI rather than the recommended <a href="https://searchwindowsserver.techtarget.com/definition/Server-Core">Server Core version</a>. The start menu is bewildering at first, but actually quick to navigate once you discover that typing a letter or two immediately brings up a list of matching applications.